India's bowling all-rounder, Bhuvneshwar Kumar, who enjoyed a terrific 2013-14 season, has been rewarded with the Polly Umrigar award for being the country's best international cricketer, the Board of Control for Cricket in India (BCCI) announced. 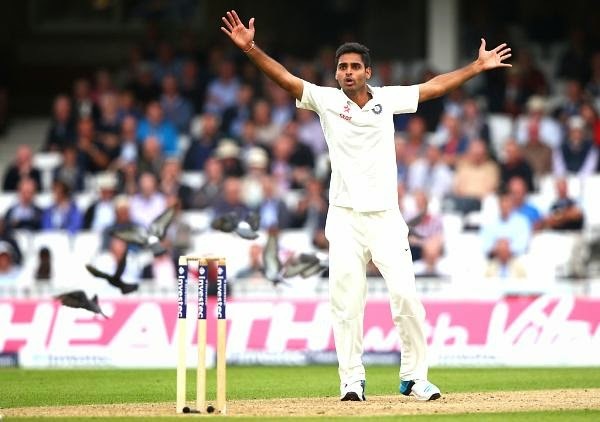 Bhuvneshwar Kumar enjoyed a fruitful season, scoring 263 runs and picking up 22 wickets in seven Tests. He also grabbed 17 wickets from 22 ODIs besides 7 wickets from an equal number of T20Is. The award comprises of a trophy and a cheque for Rs. 5 lakhs. The award has been won in previous years by Sachin Tendulkar (2006-07 and 2009-10), Virender Sehwag (2007-08), Gautam Gambhir (2008-09), Rahul Dravid (2010-11) , Virat Kohli (2011-12) and Ravichandran Ashwin (2012-13). The BCCI has also conferred former middle-order batsman, Dilip Vengsarkar, with the Colonel CK Nayudu Lifetime Achievement Award. He was nominated for the award by a committee comprising of Mr. Shekhar Gupta, Senior Media personality, Mr. Shivlal Yadav, Interim President, BCCI and Mr. Sanjay Patel, Hony. Secretary, BCCI, according to a BCCI media release. Vengsarkar becomes the 22nd Indian to be conferred with the lifetime achievement award, which was first constituted in 1994. Reacting to BCCI's decision, Vengsarkar said he was honoured to be receiving the biggest cricketing award. "I feel honoured that I have been chosen for the C K Nayudu award which I guess, is the highest award for cricket in India. I am grateful to the BCCI," Vengsarkar told PTI. Vengsarkar is the only non-English batsman to score three Test hundreds at Lord's. The third of those hundreds an unbeaten 126 in 1986 set up India's first Test win at the venue. He also became only the second Indian player to feature in 100 Tests. The middle-order batsman was a part of the team that won the 1983 Cricket World Cup, The World Championship of Cricket held in Australia in 1985, and also led India in 10 Tests as captain. The award consists of a trophy, a citation as well as a cheque for Rs. 25 lakhs and will be presented during the Annual BCCI awards, scheduled to be held on November 21st. Jammu and Kashmir's captain, Parvez Rasool, has been conferred with the Lala Amarnath award for being the best all-rounder during the 2013-14 Ranji trophy. He scored 663 runs and picked up 27 wickets from 9 matches. The award includes a trophy and a cheque for Rs. 2.5 lakhs. Karnataka's captain, R V Kumar, who led the team to a grand treble during the 2013-14 season, has been rewarded with the Lala Amarnath award for being the best all-rounder, during the 2013-14 ODI domestic season. Vinay scored 113 runs and grabbed a stunning 40 wickets from just 12 matches. His award includes a trophy and a cheque for Rs. 2.5 lakhs. Maharashtra's middle-order batsman, Kedar Jadhav, who emerged as the top-scorer during the 2013-14 season of the Ranji Trophy will receive the Madhav Rao Scindia award for the best batsman in the 2013-14 Ranji season. Jadhav, who made his ODI debut during the fifth ODI against Sri Lanka, scored 1223 runs in 11 matches at a superb average of 87.35. It included 6 hundreds and 2 fifties. Jadhav will receive a trophy as well as a cash award of Rs 2.5 lakhs. Himachal Pradesh's pacer, Rishi Dhawan, received the corresponding Madhav Rao Scindia award for being the best bowler during the 2013-14 Ranji season. He finished with 49 wickets from 8 matches at an impressive average of 20.83.